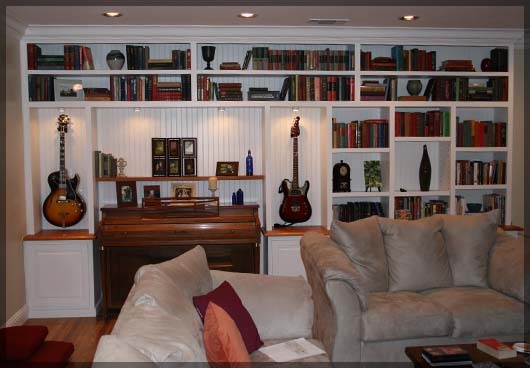 Our customers gave us a blank wall and expressed an interest in having something which fit into the style of this home which could store musical instruments, books, and knickknacks while still having storage areas that were behind doors for additional item and an amplifier. Paint grade was a must as the Fireplace on the wall to the right was already paintgrade as were the baseboards and crown mounding on the ceiling. The hand-rubbed cherry tops were added to the color scheme to ensure that the natural wood ont he piano and guitars to be displayed would be highlighted. Features such as raised panel doors, interior lighting, and bead-board were added as well to give an older feel tot he piece as a whole and highlight art and instruments. Electrical was installed inside the cabinets across the bottom to ensure that electricity would be available for the guitar amplifier and anything else which may need electricity in the future. The electrical boxes in the upper shelving were installed for lighting control which was switched onto the right hand side of the cabinet. For storage purposes all of the shelves ont he right side of the unit have been made adjustable while the shelves across the top are fixed due to their thickness and to add rigidity tot eh unit. 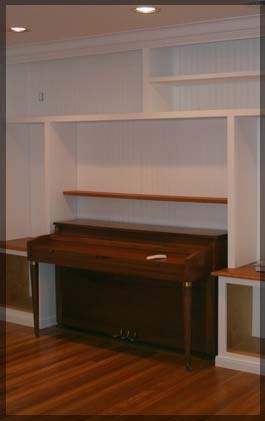 The small shelf above the piano was added so that items such as metronomes and art had their own display area as opposed to using the top of the piano to place items. The interiors of all lower cabinets are pre-finished maple with adjustable shelves to add functionality to the storage section of the unit. European hinges were used so that all doors would open and close smoothly. All of the painted surfaces were painted with Dura-Poxy to resist wear and tear over time of usage.